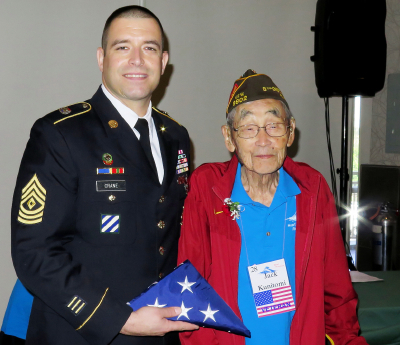 Jack Kunitomi, the oldest attendee at the Heart Mountain reunion, receives an American flag from U.S. Army First Sergeant Jeffrey Crane of the San Gabriel Valley Recruiting Company. MONTEBELLO — Hanako Horiuchi Nakamoto and Suyeko Horiuchi Yusa gingerly entered the banquet hall in Montebello, eager to reunite with friends, many of whom they’d first met more than 70 years ago. Dorothy Hashimoto Akiyama regaled those around her with her bubbly personality and unique brand of humor. Bacon Sakatani served as ringmaster, keeping things moving apace and refusing to rest until he was sure that everyone present had a good time. The Horiuchi sisters, Dorothy, and Bacon couldn’t be more different from each other, but as children during World War II, they all lived in the same unsavory place — the War Relocation Authority camp at Heart Mountain, Wyoming. 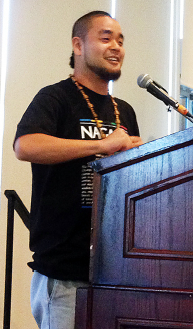 Spoken-word poet George “G” Yamazawa. They were gathered for the Heart Mountain Reunion on Sept. 10 at the Quiet Cannon in Montebello. As surviving former incarcerees, the youngest are in their early 70s while the oldest, Jack Kunitomi, is 100 years old. However, it was someone much younger, 24-year-old George “G” Yamazawa from North Carolina, who kicked off the reunion program. Yamazawa, an award-winning performance artist, read emotive poems, paying tribute to his Japan-born grandmother and the Japanese American camp experience. Pomona and the stables at nearby Santa Anita were among several hastily prepared facilities used to confine Japanese Americans after President Franklin D. Roosevelt issued Executive Order 9066, prescribing certain areas as military war zones. The reunion became an opportunity for today’s military to honor the Japanese Americans who joined the armed forces to defend the rights unjustly denied to them and their families during the war. “In the face of adversity, they joined together, creating small societies that managed, through all of the chaos and turmoil, to be supportive, nurturing, and productive. Brian Liesinger, executive director of the Heart Mountain Wyoming Foundation’s Interpretive Learning Center, surprised the approximately 300 in attendance by announcing his resignation. Liesinger’s wife has been offered a position in another state, and he will be joining her.